Baby Alexander was screaming. Joe was driving in a torrential downpour, and I was in the back seat trying to comfort Alexander and, simultaneously, help Joe navigate New York City traffic to JFK Airport. That was how we started our trip to Ireland with a baby. Not exactly stellar coming right out of the gate. We made the 4+ hour trip to JFK before, but I generally wouldn’t recommend it with a 7-month old. All turned out ok, but it wasn’t the introduction to traveling internationally with a baby I had hoped for. We learned a lot on this first trip with Alexander. It was kind of like our first trip to Ireland all over again.. I did quite a bit of research about traveling internationally with a baby, because #obsessiveplanner. And it helped quite a bit, but nothing prepares you better than actually doing it. So a quick note of encouragement for the moms and dads considering going to Ireland with your child. Just do it. Traveling with your little one will be one of the most special experiences of your life. They might not remember it, but you always will and you’ll treasure the experience. Plus you’re creating intrepid little travelers who will be curious and excited to learn about the world around them. I can’t think of anything better. So I wrote this two-part series (see part 1 here on Packing for a Baby.) just for you, mom and dad of the second most adorable kid in the world (I kid…kinda :-) ), to make planning a little easier. I hope it helps. 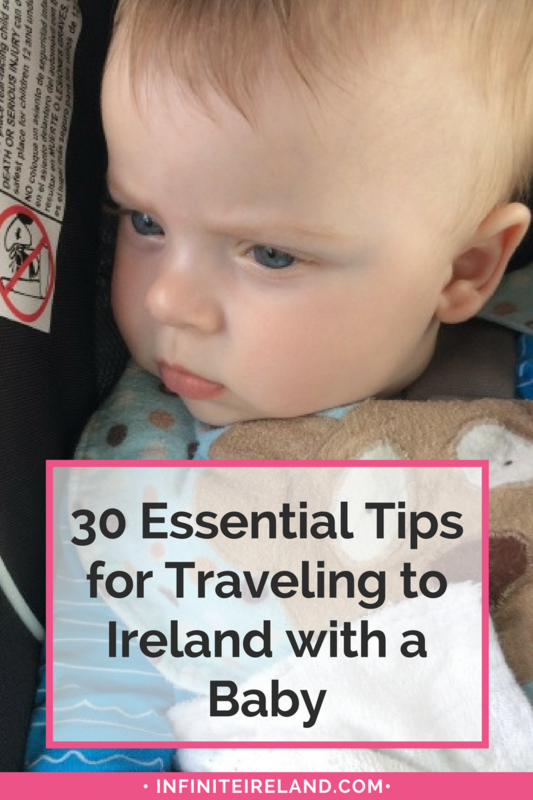 (Oh and here is part 1 of this series: What to Pack When Traveling to Ireland with a Baby). 1. Double/triple check your lap baby is listed on your ticket before you arrive at the airport. Our experience: Alexander was listed on my ticket as a lap baby, meaning we only needed to pay taxes and fees for his flight, and he was able to sit on my or Joe’s lap for the duration of the flight. When we arrived, they could see his name in the system, but he wasn’t on my physical ticket, and they couldn’t get the two to match. Ugh. All eventually was cleared up, but it took about 45 minutes to resolve. 2. Give yourself three to four hours before your flight to check-in, go through security, find your gate, feed, etc. before your flight. Our experience: After the the screaming, the rain, the traffic, and the ticket incident, we were already a bit behind in getting to our gate. I had really hoped to have some time to relax and grab a bite to eat before we boarded. We thought we had plenty of time, but we cut it way too close for comfort. Joe dashed to grab some snacks. I resituated Alexander and #allthethings before we boarded. 3. Carefully consider whether you need a small stroller for your little one in the airport (knowing it won’t be much use when you are in Ireland). Our experience: Alexander was still in an infant car seat, which included a base for the car and a stroller it could click in and out of. We took all three items with us, but the stroller was really only useful in the airport. It was nice since we were hustling a bit to get to our gate to not have to carry him, but I think we only brought it out twice for a total of twenty minutes for the entire rest of the trip. 4. Gate check the stroller and the car seat and the car seat base. Our experience: This is a pretty simple process. We brought a gate check bag with us that the car seat and the car seat base fit into. It had even more room, which meant I was able to stuff a few things in it that we knew we would want right after landing but didn’t need on the plane. 5. If you are lucky enough to have two people traveling, have one person board first with the bulk of the carry-ons and a pack of sanitizing wipes. The second person follows a few minutes later with the baby. Our experience: Joe purposefully boarded first. Once he found our seats he wiped down all the surfaces that Alexander could touch: arm rests, window, area next to the window, seat belts, seat back and front, etc. By the time I got there, all was wiped down and ready to go. Have you ever seen those reports about germs on airplanes? No? Don’t look. Just trust me. 6. To alleviate ear pressure that occurs during elevation changes, feed your child during take off and landing. Our experience: We waited about 30 minutes on the runway before our plane took off. Alexander was happy to be in a new environment, but we were getting well past his usual dinner time. The plane eventually started to move and so I began to feed him. He fell asleep not long after and stayed asleep for the entire journey to Ireland. Once we arrived, I waited to wake him until we were the very last people on the plane. This meant we were last in the customs line, but we were also able to take our time to gather our things and didn’t have to wait at the gate for our items to be brought up since they were already there. We were able to easily transition Alexander into the stroller without holding others up. If your little man or woman is awake on landing, be sure to feed them or offer a snack or juice so it helps reduce the pressure in the ears by making them swallow. 7. Use pre-mixed liquid formula and bring as many clean bottles you think you might need for the plane ride. Our experience: I was half breastfeeding/half formula feeding at the time and didn’t want to worry about mixing water and powder on the plane or cleaning any of Alexander’s bottles. We really only needed three bottles for the flight over and the flight back, but I wanted to have additional formula in case we were delayed. I also wanted all of our formula with us for the return journey so that nothing would happen to it. 8. Make sure your little one is comfortable with drinking room temperature bottles before you leave. 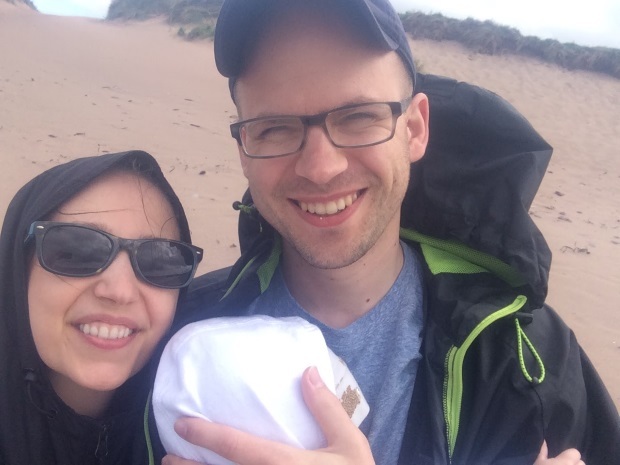 Our experience: Several weeks before we left, we started to not heat Alexander’s bottle. Surprisingly he couldn’t have cared one bit, but I think most babies like their milk warmed. If it’s a no go and your kiddo needs their bottle warmed, bring a thermos that your bottle fits into and ask the flight attendants for piping hot water to put in it. Pop your bottle in and voilà instant bottle warmer. 9. Bring as little as you can into the airplane bathroom (i.e. wipes & diaper) & don’t use water in bathroom for anything for the baby. Our experience: Airplane bathrooms are gross, small and hard to change a baby’s diaper in, period. There are a few things that might help you navigate this stinky conundrum (the bathroom, not the baby). There may be only one restroom that actually has a baby changing facility. You can find a sticker near the handle that indicates there is a changing table inside (it’s also typically the handicapped accessible toilet). Ask a flight attendant if you’re not sure. The changing table itself is a shelf over the toilet and it is small (really small). So you’ll need to be quick, creative and won’t want to go through your diaper bag to dig any items out. Plus, I wouldn’t want it touching any of those surface anyway. 10. Adults can take care of themselves. Babies cannot. You cannot be responsible for the happiness of others. 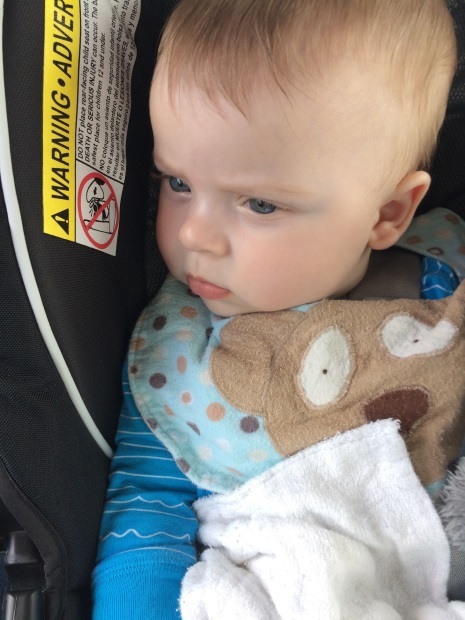 Our experience: I was initially petrified about taking Alexander on the plane, particularly that he would be screaming the whole time and angering the other passengers. But somewhere along the line I received some great advice. You can only be responsible for you and your baby. And any reasonable human being will understand that you don’t want your baby crying as much as they don’t. We had several passengers board the plane after us. When they passed our seats, they stopped to say hello and said don’t worry if he cried. I mean multiple people said this. Others came by later to share stories about their first time flying with a child. We even had a few tell us what seat number they were sitting at in case we needed a break or someone to hold him. It could not have been better, but truly, remembering that advice really helped my mindset. Just take care of your little one like you always do (and I give you permission to give anyone who sends a look your way the death stare). 11. Walk the aisle, hang out in the area between cabins, and ask the flight attendants where would be best to hang for a while with the baby. 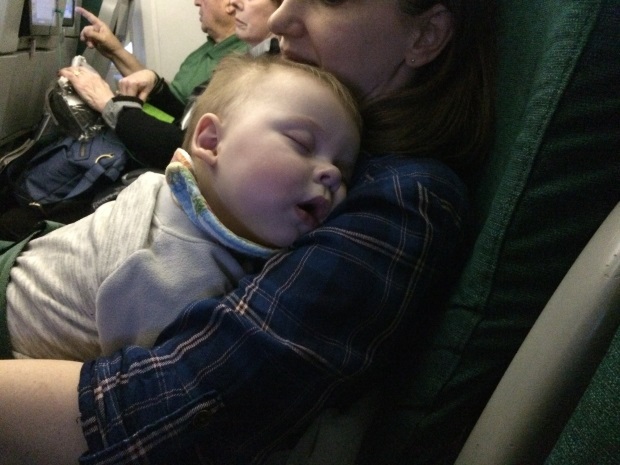 Our experience: The flight attendants were great and super helpful with the baby. When Alexander needed to take a nap on the flight back, it was so much easier to rock him to sleep when we were standing. We stood in bulkhead space between the cabins and rocked away. The people seating in the seats facing us didn’t seem to mind at all (most were watching movies or sleeping themselves). On both flights the flight attendants arranged to have the person sitting next to us in our row of three moved to an open spot. Of course, they can only do this when there actually is an extra seat, but it was incredibly helpful and so much appreciated. 12. Bring your own car seat. 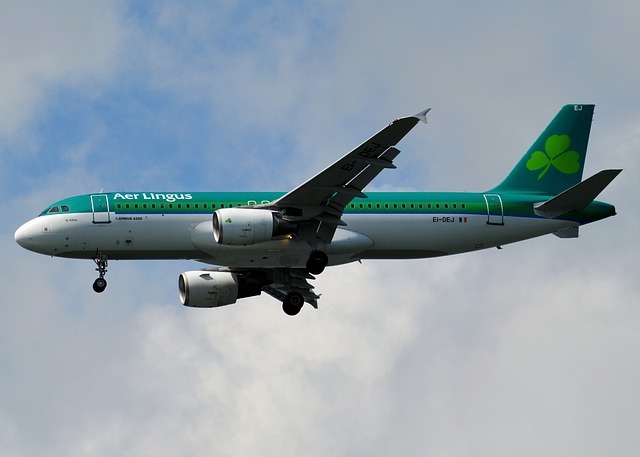 Our experience: You can rent car seats from the car rental company or even a local baby equipment rental shop if you arrive in Dublin, but I was too concerned about the shape of the equipment by the time we got it. I knew the whole time I would be wondering if it had been in an accident before or if there was a piece missing that we didn’t know about. So we opted to bring our own car seat and I am so glad we did. We knew how to install it already. We had all the accessories, and we were able to use it driving to the airport in the US as well as in Ireland. Almost all new car rentals in Ireland will have the ISOFIX system, which is essentially the latch system in the US. Since we use the latch system in our car at home, it was really easy to install our car seat in Ireland. You may need to pop off the plastic insert to fit your latch onto the anchor. We had to. It’s the yellow thingy in the photo below. 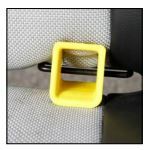 This is guide has everything you need to know about car seats and requirements in Ireland (including pictures of the ISOFIX latches). 13. Leave the big stroller at home, bring the baby carrier. 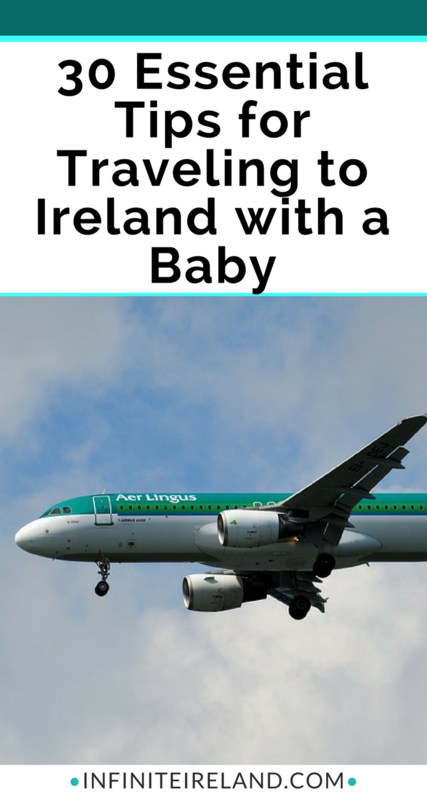 Our experience: As mentioned above, we used our stroller in Ireland barely at all. I think we got it out once to take a walk in our neighborhood and another time when we thought maybe Alexander would fall asleep if we kept him in his car seat/stroller attachment (he didn’t). It was hardly worth it except for the mad dash at the airport. We did use our baby carrier a ton though. He was in and out of that thing like a champ each day and I don’t know how we would have done the trip without it. We brought a cheap knockoff carrier that we had used around town. After the trip, I began using the ergo carrier, and I wish we would have had that one with us. We weren’t bothered by it though (probably because we didn’t know how much nicer a good carrier can be…). 14. Don’t plan anything big (or at all) for the first day or two. So I made sure that Alexander’s sleep and eating schedule stayed as consistent as possible throughout the trip. The first day, we drove to our accommodations and let Alexander take a couple long naps while Joe and I enjoyed the grounds of our accommodations and took a couple short snoozes too. We went out to eat and made it an early night. Alexander naturally woke up at some random time that night, but I picked him up and let him rest on me for a while until he fell back asleep. The next day, we woke up and ate at local time. He might have been a little cranky that day, but by day three he was completely adjusted (probably better than we were). 15. Stick to his schedule. Our experience: At the time we went to Ireland, Alexander was taking an hour and half nap in the morning and another in the afternoon. He would awake at 7 AM and be asleep by 7 PM. We did our best to make sure he got those naps in (whether at our cottage or on the road) and was in his bed by 7 PM each night. Yes, that meant that we weren’t doing any evenings of traditional Irish music or pub crawls this trip, but it did mean we had a very happy baby and we were able to see quite a few things throughout the day without huge meltdowns. That’s not to say there won’t be huge meltdowns in the future. I am sure there will be, but I think having a schedule really helped him enjoy the trip as much as we did. 16. Travel cot = Pack n Play. 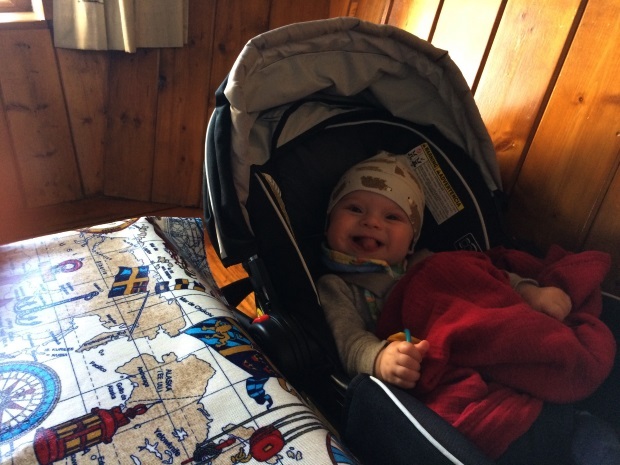 Our experience: We were able to ask for a travel cot at every place we stayed. Once the hosts knew we had a baby coming to Ireland with us, they also provided baby blankets and a high chair (one place went way above and beyond that too). The pack n play was exactly what we needed for our little man at 7 months and it would still be what we would want at 18 months (thank goodness he hasn’t figured how to climb out yet!). 17. Bring a light crib sheet for the pack n play. Our experience: One of the travel cots we received had a lovely pillow top cover. I was a complete nervous wreck about SIDS for the entire first year, so we took that out in favor of the plain pack n play pad below. Unfortunately, when Alexander drooled at night some dye from the pad stained his cheek for about a day or two. While a traditional pack n play sheet would be a little too small (they are slightly bigger in Ireland), I wish I would have brought along a crib sheet and some pins to secure it tight. 18. Bring your own formula with extra to spare. Our experience: While Ireland actually manufactures several varieties of formula for the US, there is no guarantee that you’ll be able to find your brand in Ireland. I looked for ours (Enfamil Infant Powder), and it wasn’t available. Alexander was a “spitter” and I couldn’t risk having him not react well to a new formula brand. I was so glad I brought more than enough supply for the duration of our trip. 19. Distilled Water is expensive and not super easy to find. Boil or use bottled water for formula. Our experience: I agonized over this before we left. We use distilled water to mix our formula at home, but distilled is only found in pharmacies and auto shops and is very expensive (like several euros per liter). The next best options were to boil the water or purchase bottled water. We purchased Evian and used this throughout the trip. 20. Use a cover up while breastfeeding in public. Our experience: I am a big supporter of women being able to breastfeed in public, but as a fairly private person, I always used a cover up. Breastfeeding in public is legal in Ireland and a woman should not be asked to stop nursing, leave a premises or use separate facilities, but you should know that not everyone is super supportive. You won’t find many Irish breastfeeding in public. So while we were out and about, I nursed in the car and used a muslin blanket cover up. 21. Drink lots of water, breastfeeding mama! Our experience: Traveling long distances can really reduce your milk supply. Mostly because you can easily get dehydrated. I really struggled to produce just a couple of ounces a day during the entire time I breastfed, but when we were in Ireland my supply was even worse. I should have drunk more water and brought along Mother’s Milk Tea. I didn’t fully recover my already small supply until a few weeks after we returned. 22. Baby food, diapers and wipes can be purchased in Ireland. Our experience: We frequented Dunnes, Tesco and SuperValu for all our food/diapering needs. I brought along enough to get us through the first few days and then we bought what we needed along the way. We use Pampers and WaterWipes at home and both were available anywhere we went (Fun fact: Waterwipes are actually made in Ireland). Our experience: I love saying nappies instead of diapers. Just one of those fun culturally different terms. 24. Ask where you should dispose any dirty diapers. Our experience: Each host had different directions for us for our diapers. Some wanted them in a separate bin (or garbage) so just ask before you chuck them in with the banana peels. 25. When changing diapers on the go, use the trunk of the car for a flat surface. Our experience: I tried changing Alexander in the back seat and the front seat, but it was the trunk that ultimately won me over. Without our luggage, there was enough room for him to lay completely flat and for me to not lose the contents of the diaper across the floor. 26. Travel before your baby is on the move. Five to seven months is the sweet spot. 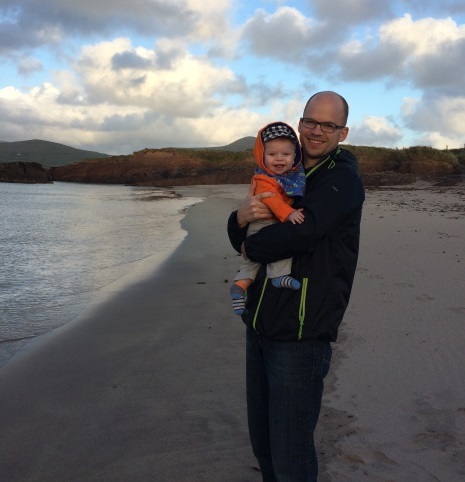 Our experience: Alexander was 7.5 months when we went to Ireland. He was 6 weeks premature so his motor development was that of a six month old. He was able to do a good rollover, but wasn’t fully on the move yet, which worked out perfectly. Now that our little man is almost a year and half, I can see why the advice is to travel before they can crawl/walk. Keeping him contained in the car seat, high chair, even in the grocery store is a challenge these days. If your son or daughter is older than seven months, don’t fret. Use the tips below to keep them entertained. 27. Pack new toys (or hide old favorites well before the trip) to bring out at various times throughout the trip. Our experience: I had stashed away a different toy for every day of the trip. I knew I wouldn’t need one each day, but I also thought there may be a few days I might need more than one as distraction. I picked small items that stuffed well into our suitcases and carry-ons, and specifically hid some of his favorites a week or two before we left so that he would be extra excited to see them when we needed it most. 28. Pick kid friendly places to stay like cottages or whole house rentals. Our experience: There are definitely kid-friendly B&Bs throughout Ireland, but I could not pass up the chance to have our own kitchen to mix formula, wash bottles, offer baby food/snacks, etc. If you have a little one less than a year old, I would 100% recommend renting a cottage or two for your trip. 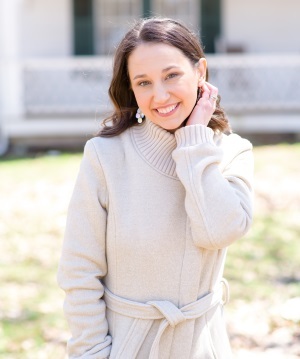 Other than that, I think it is convenient to rent a place, but you can also go with a B&B that accepts children (ask, because some places have an age recommendation). 29. Use a backpack as your diaper bag. Our experience: Joe and I each carry a backpack during our trips, and I am not sure why I didn’t think that we would also want one for Alexander too. Joe and I ended up sharing a bag and Alexander got his own (I still don’t know how someone so little needs so much stuff!). 30. Bring back up batteries for your sound machine (or be sure it doesn’t have a motor). Our experience: We had a great sound machine that Alexander loved, and we brought it to Ireland with us. About half way through the trip, we fried it somehow. It had a motor to cast shapes on the ceiling that we never used, but I am assuming that the functionality of the sound machine relied on the motor somehow. Luckily all our accommodations had a radio and we used an AM station with static as background noise. Next time, I will be sure to bring the batteries. Want more tips?? Get my favorite tips for Ireland and the best packing list with all things you need pack (and do!!) for your big trip. Enter your email below to get all the goodness. Kiddo, you’ve really got it going on! Props to you and your hubby for being adventurous and flexible with a little one! Your husband must be a pretty good sport as well, I’m not sure mine would have been willing to take the chance! That baby is adorable!